[Alex], aka [Grovenstien] turned 30 this weekend. After a conversation with his sister, where she asked: “what was that website with the skull that you always look at?”, he thought maybe he’d get a sticker or a shirt. She surprised him with this totally awesome birthday cake! There really aren’t any build details, but you can pretty much see that it has LEDs for eyes as well as some crazy sparkler effects going on as well. What we’re particularly impressed with is the fact that everything was hand cut, even that crisp text at the bottom. Happy Birthday [Grovenstien] and awesome job big sister! check out the rest of the pictures after the break. 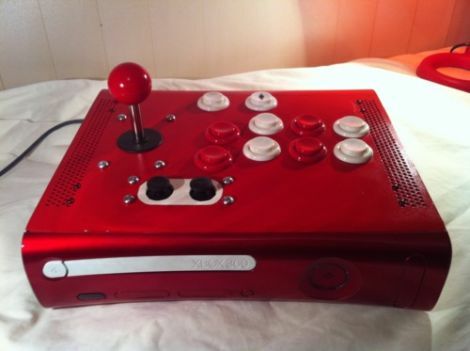 Like many Xbox 360s out there, [Aaron’s] console succumbed to the dreaded three red lights of death. Since it seemed to be unrepairable, there wasn’t a lot that could be done with it other than throw it out. Rather than be wasteful however, [Aaron] thought of a great way to reuse the console’s outer shell. He’s a big fan of fighting games, and as everyone knows, this genre is best played with an arcade-style controller. The 360’s shell seemed to be just about the right size, so he gutted it and got busy constructing his own arcade controller. With the console cleared out, he installed all of his arcade bits, wiring them to a stripped third-party Xbox controller. He installed a four port USB hub to the front of the console, enabling use of the 360’s USB ports, and rewired the power button to trigger the Xbox Guide button. A shiny coat of paint later, and he was ready to play. Keep reading to see a short video of [Aaron’s] arcade stick in action, and check out the picture gallery he put together of the controller’s construction. This little beast is named Mechatron. Built by a father/daughter team called Beatty Robotics, the goal was to build something “retro-futuristic, tough, and industrial”. We think they definitely pulled off some of their goals here. Weighing in at nearly 50 pounds, Mechatron is still very agile, as you can see in the video below. He can fire his gun, which uses brass or plastic bullets, at a rate of nearly 1,000 rounds per minute while traveling in any direction thanks to the use of the mechanum wheels. 8 range finding sonar sensors, a laser and a turret that rotates 360 degrees will make sure you don’t elude Mechatron’s watchful eye… and shooting. While we were initially debating how they could make the Mechatron look more reto-futuristic, we all agreed that the lights in the video helped a lot. Maybe a curvy body piece could help too, depending on what era they were hoping to achieve. 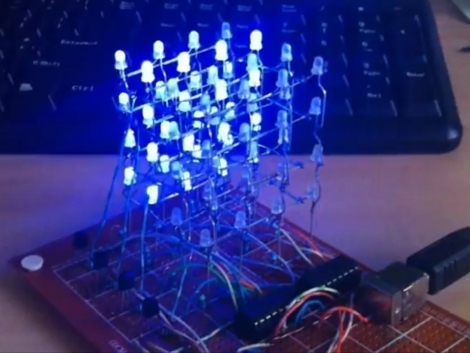 [Kirill] wrote in to share his ATtiny hack, a 4x4x LED cube. The 64 LED display is a great choice to fully utilize the hardware he chose. It’s multiplexed by level. Each of the four levels are wired with common cathodes, switched by a 2N3904 transistor. The anodes are driven by two 595 shift registers, providing a total of 16 addressable pins which matches the 4×4 grid perfectly. All said and done it only takes seven of the ATtiny2313’s pins to drive the display. This is one pin more than the chip’s smaller cousins like the ATtiny85 can provide. But, this chip does include a UART which means the project could potentially be modified to receive animation instructions from a computer or other device. You may have noticed the USB port in the image above. This is serving as a source for regulated power in lieu of having its own voltage regulation hardware and is not used for data at all. Check out the animations that [Kirill] uses on the display by watching the video after the break. You’ll find a link to the source code there as well.